Need advertising or decorative banners? We can provide any sized banners with quick delivery. We provide vinyl decals and printed graphics for vehicles, signage, branded environments, and more. 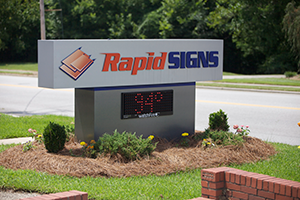 Many years of industry experience and knowledge have earned Rapid Signs, LLC the reputation of being an efficient and reliable source for sign products in North Carolina and South Carolina. Rapid Signs, LLC is was formed by sign experts with decades of experience working for a family business dating back to the 1940’s. Rapid Signs, LLC promises its customers quick turnaround times and consultation with an expert that will suggest the best solution to meet each customer’s budget and other criteria. With your individual budgetary and branding needs in mind, Rapid Signs is the Charlotte, NC, Columbia, SC region’s source for the most modern and long-lasting products including architectural signs, LED message boards, decorative or advertising banners, ADA-ready interior signs and interior or exterior directional/way finding signage. Our reputation was built upon many years of friendships and customer service. We are based in Lancaster, SC which is centrally located between the Charlotte, NC and Lancaster, SC areas. We can deliver and install signs for projects big and small, or refurbish your existing sign within the vicinity of Charlotte, Columbia or upstate South Carolina. No matter what the size of your project, we will gladly give you a quote to design, install, or refurbish your sign. Contact Us Today.